38:1-9 – Who is Gog and what will he do? 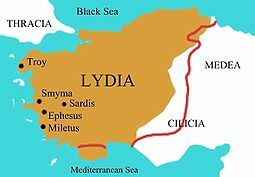 It is believed that this is a reference to the recent figure Gyges of Lydia (reigned in approximately the first half of the seventh century BC according to certain Assyrian records) who was a usurper of the Lydian throne and reputed to have first printed coins. He is recorded here in Ezekiel as being of the land of “Magog” (which may be possibly taken as “land of Gog”) and the “chief prince of Meshech and Tubal” (cf. Eze.27:13; 32:26 for their presence in the grave; also Ps.120:5-7). 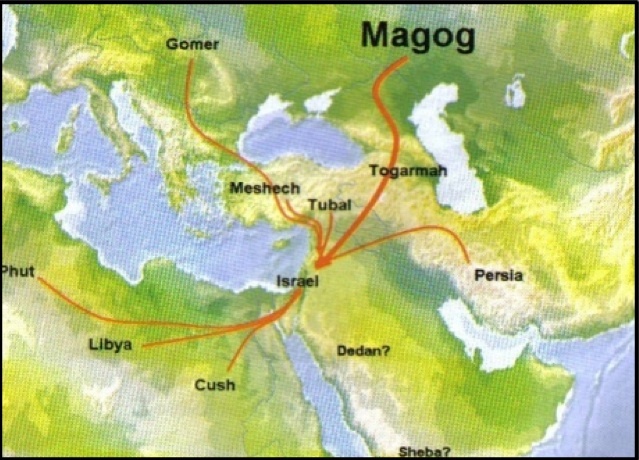 The names Magog, Meshech and Tubal are all listed in Genesis 10:2 as sons of Japheth. They appear here to refer to locations in the western Anatolia and thus to be representing those at the fringe of the north for Israelite concerns. Who is actually bringing Gog and his horde against Israel? Allied with them are the combined forces of Persia (? ), Cush (upper Egypt) and Put (Libya) representing the southern hordes. From still further north than Lydia (and east), the armies of Gomer and Beth Togarmah (likely the Cimmerians) are gathered as well. These would serve as representatives of the most wild and vast armies of the world. They are called to gather at some distantly future time in order to invade a regathered Israel that is finally at peace. 38:10-16 – The thoughts and conversations of Gog. Who will be responsible for Gog’s plans to conquer Israel? Also, who intends to benefit from Gog’s plans? The representative nations are from east (Sheba and Dedan) to west (Tarshish). This would then entail the peoples from every direction in the plot to destroy the nation that lies at the center of the LORD’s plan for the ages. “Why would Yahweh bring Gog against his own people after the covenant relationship had been fully restored? Because an element in the divine agenda, the universal recognition of his person, remains unfulfilled” (Block NICOT II:451). Is there a distinction between the self-revelation of the LORD and the revelation of the holiness of the LORD? 38:17-23 – The battle between Gog and the LORD. How should we understand the question in verse seventeen? Where would such prophecies possibly be found? Some have suggested a radical changing of Isaiah 14:24-25 and Jeremiah 6:22, however it may be that the question was rhetorical and should receive the answer of “No”. Gog was not called as the hand of judgment against Israel (as the Assyrians and Babylonians before him had been), but instead is brought against Israel for the judgment of the nations. At some undefined moment in the future the battle would be engaged, but instead of Israel taking up the fight the LORD Himself would fight on their behalf. The world will be shaken and made to tremble and radically altered (cf. Isa.24:17-20; Joel 2:10; 3:3-4, 15-16; Hag.2:6-7; Zech.14:4-5; Matt.24:29-30; Rev.16:17-21). Not only will the LORD bear the sword against the hordes, but they will fight against one another (as at other pivotal moments in Israel’s history). Divine judgment (as plague, bloodshed, torrents of rain, hailstones and burning sulfur) will be poured out on that great host in order to demonstrate the greatness and holiness of the LORD. 39:1-8 – The slaughtering of Gog and his allies. Notice that once again the LORD says He will be the one bringing Gog against Israel, but He will also be the one to defeat Gog (particular emphasis upon the weapons of archers for which the northern kingdoms were renowned). Those who gathered for the battle will be destroyed as well as those who supported the invasion. Note the reason the LORD gives for this: both for the nations and for Israel. Though the day is far off from Ezekiel’s pronouncement does this mean that it will not happen? 39:9-16 – Israel must be cleansed. Those who were living in safety now leave their homes to pick up all of the weaponry (seven types listed) that remains (which is said to last seven years) to use as fuel for their home-fires and to bury all of the dead (which is said to take seven months). The use of seven seems to suggest completeness as to the destruction and cleansing. There will be so many to bury that there won’t even be room for travelers through that portion of Israel which is then to be called the Valley of Hamon (“horde of”) Gog – sounding rather like a play on the Valley of Hinnom outside of Jerusalem. What does Ezekiel mean by stating that the cities name will be “Hamonah”? It may likely be a symbolic name for Jerusalem which had earlier in his prophecies been described as being filled with hāmôn (cf. 5:7; 7:12-14; 23:40-42; and Block NICOT II:471-2). This would serve as a memorial of what Jerusalem had once been and how the LORD Himself had delivered her. 39:17-21 – The sacrificial feast of the nations. Ezekiel is told to call all of the carrion creatures of the land and air to gather for a gluttonous and macabre feast upon the armies that were slaughtered (cf. Isa.34:6-8; Zeph.1:7; Rev.19:17-21). The rulers and great men are referred to by names of animals for divine sacrifice and the parts usually reserved for God are consumed by the creatures of the earth. What is the point of including such a grotesque description? 39:22-29 – Israel is returned. Will Israel be able to take credit for returning from exile? What significance is given by the LORD’s face having been turned from Israel and what might be the difference between that and His face being turned against Israel? Is Israel’s blessing (and was their judgment) for themselves or for the nations? Does the LORD leave any of His people behind? It is a wonderful thing to know that whereas the LORD had once poured out His wrath (Eze.7:8; 9:8; 30:15; 36:18) in that day He will pour out His Spirit (cf. Joel 2:28-32).